Caption slip reads: "Photographer: Olmo. Date: 1956-03-01. Reporter: Dunn. Assignment: Ventura County Shoreline Development Plan. 67-68: J. Edward Sheehy, Ventura City Engineer, points to beach area planned for recreational purposes. 69-70: Thomas H. Durfee, Ventura City Planning Commission chairman. 71: Portion of San Buenaventura State Beach, in county's master plan. 72: Same as No. 71, except looking North. 73-74: General views of offshore oil operations in Ventura County. 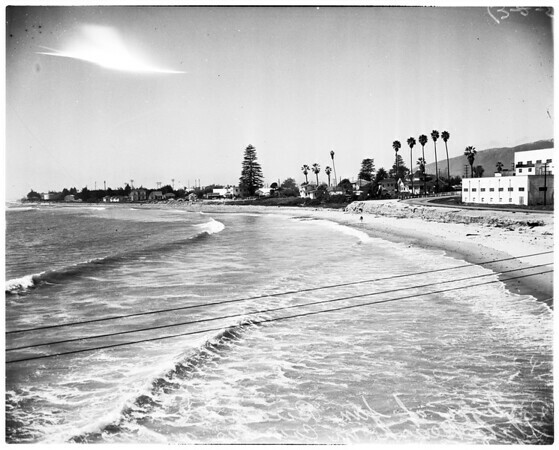 75-76: View of rock strewn beach near City Ventura. 77-78: L.J. Borstelmann, secretary and planning director of the Ventura County Planning Commission, Points to map".